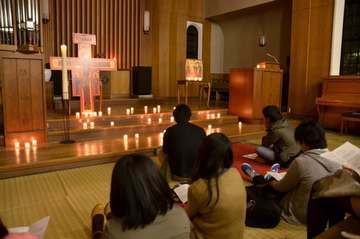 To get ready for the summer of 2015 in Taizé and to continue to reflect on a “new solidarity”, some texts written by young people from Asia are published on this page. Rafayel, a young Bangladeshi, reacts to the theme of the visible communion of Christians developed by Brother Alois in his "Proposals 2014". For me, the search for unity means to share, to help each other. It means to agree, to communicate in order to work for peace; it also means helping others to succeed in life. When we are ready to work together, then we can talk about searching for unity. In Bangladesh there are many divisions between people, between ethnic and religious groups, much opposition among the political parties that can even result in violence. Most people, organizations and even Christian denominations are very concerned about their own interests. As a Christian , I work to awaken the desire for unity among youth. They come from different Churches, different ethnic groups and also various religions. Every weekend I travel to visit young people from different parishes and reflect with them on the themes of unity and interpersonal relationships. The idea is to make them more aware of the deeper meaning of life. We organize times of prayer, creative activities , games, and we all take part in practical tasks . There are also times of Bible sharing or sharing on other religious texts. After an introduction and a time of discussion in twos or threes, everyone can express themselves in front of the entire group. Here are some of the topics we discuss during these sessions: who am I? what is the meaning of my life? And again: the love of Christ , the barriers that we discover in our lives, the search for unity, society and work for peace. Pastoral leaders in the area are happy to join us and they encourage me a lot. Sometimes I am given the opportunity to share with local religious leaders—pastors, priests, imams. So I work with a lot of young people of different affiliations, with Hindus and Muslims as well as with Christians. Taking part in this program and sharing with others on the question of unity, I hope that young people and their religious leaders can take a step towards each other and realize that this is a burning question that calls for a commitment from all of us, for a better understanding between members of different churches and religions and, therefore, for the whole of society. Students’ chaplains at a college in Colombo reflect together on the young people entrusted to their care. Students and young people in Sri Lanka today are faced with the same challenges as in the world at large. Those of us involved in education are able to recognise these challenges through our constant interaction with the young people in our schools. Sri Lanka has witnessed two violent youth uprisings, in 1971 and 1988-89, that were ruthlessly repressed by the State. Today the trend may not be towards armed uprising, but there is certainly much dissatisfaction. Anger and frustration are fostered by a culture of violence and by the criminality that characterises a post-war country. We must accompany these young people who have been disoriented and confused by the war that raged for over 30 years. From a physical point of view, one could say that this war has ended, but the mental and psychological trauma, and the after-effects continue – there is no peace. Fear, suspicion and hatred haunt us. Behind a façade of ‘normality’ is a shallow effort to get on with life. In a futile effort to leave behind a painful and guilt-ridden past, we engage in an unreal spirituality. We need to develop a genuine spirituality. The road to recovery after the disaster is still long. Many people are living in temporary housing. 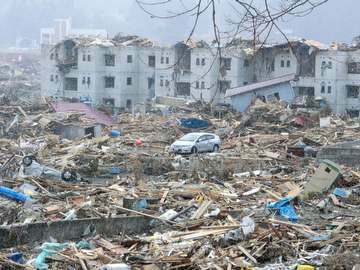 I do not know when the victims will be able to move into rebuilt housing. It is said that it will take 10 years to rehouse all of them. 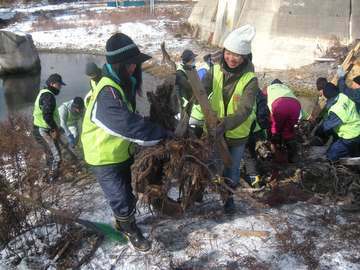 In the town of Minamisanriku, 62% of houses were washed away by the tsunami. There are many fishermen who cannot even buy a fishing boat because of the effects of radioactivity. For the future, we must think seriously about how to live on the Earth and to co-exist with Nature. In creating a relationship of service from the heart, I would like to ask you to pray for us as we go towards the future with hope. One of the major challenges these days for young people in Japan is to know how we can continue our journey of trust with our neighbouring countries. After the disaster of the tsunami, when we were in trouble, we felt that we were very close to each other. However, I feel there have been rapid changes ever since in our relationships with these countries, especially with China and Korea. Up to now, these feelings came rather from older generations, but now they are spreading among younger generations who are not interested in politics. I think all this is largely rooted in despair and in enormous fear about an uncertain future. 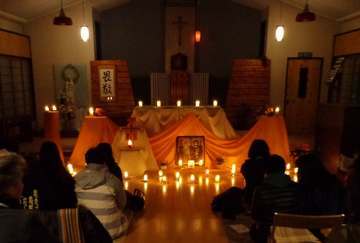 I took part, for the first time, in a two-day retreat with a brother of Taizé at Shimonoseki. I had wanted to participate in such a meeting for a long time, after getting to know about the community at the volunteers’ base in Yanekawa where I worked for vicitms of the tsunami. During the retreat, I realised how far I was from spending time in silence in my daily life. I realised that silence helps us a lot to open our hearts in prayer. Many of the people taking part in the retreat were people I had never met before. However, after two days I saw gentle smiles on everyone’s faces, who were caring for one another. I felt that we had shared a great deal in prayer, even without talking. Each one of us, although it is often invisible, has a hidden thirst of simple love for others. The biggest problem among Japanese young people is that they have nothing reliable, nothing worthy of trust, even though deep in themselves it is for this that they really thirst. In a widely secularised society, religion is not generally something that they can really believe or trust. In addition, with a more difficult economic situation, their future is very uncertain. Thus more and more young people come to have a kind of sophisticated racism, especially when faced with certain territorial problems between Japan and the neighbouring countries. I think that this sort of ideology can offer them a very simple answer that gives them the illusion of reliability. The challenge for them is to find something really reliable, and to rediscover trust in their lives. It is more and more demanding for them to build up trust and reconciliation between Japan and its neighbouring countries. Based on the Gospel, I would like to sow seeds of trust, and to share the hope that we are all really loved and accepted as we are. That is truly a great hope for the young people and children of Japan, because they really thirst for such a reality, but have no way to find it. It is not easy, but this is what I try to do – not only with words, but also through the way I am , and by providing opportunities to experience community, in humble and simple ways. If you would like to respond to any of these echoes or add your own testimony “seen from Asia” on the theme of solidarity, please write to us at: echoes taize.fr.